The following article originally appeared in New Jersey Jewish News, February 6, 2018, and was written by Jill Garbi. 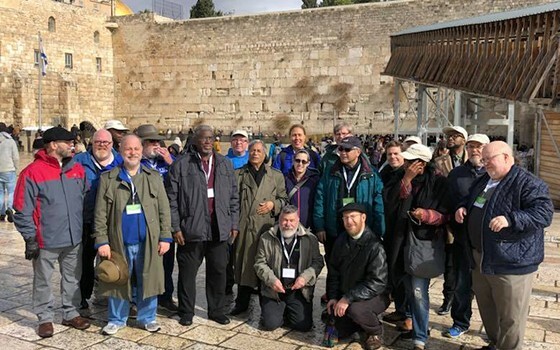 The multiple narratives heard by members of the recent Interfaith Clergy Journey to Israel underscored their own respective divergent views of the country. Yet the group of 20 Christian, Muslim, and Jewish religious leaders came home as ‘a brotherhood and sisterhood’ intent on nurturing mutual understanding and hope in their respective New Jersey communities. Many of the participants, in fact, viewed the Jan. 17-24 mission, sponsored by the Jewish Federation in the Heart of NJ, as life-changing. “It was everything I prayed for and more,” said Rabbi Marc Kline of Monmouth Reform Temple in Tinton Falls, who serves as the federation’s interfaith chair and who chaired the mission with federation executive director Keith Krivitzky. Krivitzky said the mission was designed to give participants a behind-the-scenes look at what life is like in Israel and the West Bank, beyond what they see in the headlines or on social media. The fellowship among the clergy members was palpable. NJJN met up with the group in Tel Aviv on the last day of the mission, as intense discussions about politics and faith were infused with liberal doses of humor. “We are brothers of different mothers,” said Kline as he draped his arm over Mustafa El-Amin, imam of Masjid Ibrahim in Newark. The imam marveled at the convergence of the sacred sites. “It was breathtaking for me to overlook the city of Jerusalem and see the Dome of the Rock, the Western Wall, and the Church of the Holy Sepulchre next to each other and to hear the Muslim call for prayer and the church bells,” El-Amin said. “To see these holy sites alive with activity so close to each other raised the hope that the peace we all yearn for will one day be realized. There’s no other place like this on the face of the earth. “We cannot apply the same rules of logic that we apply anywhere else,” he said. A cofounder of the New Jersey Muslim Jewish Solidarity Committee, Mohammad Ali Chaudry said the interfaith journey helped reinforce a committee pledge. Chaudry is also a cofounder — with Kline — of the New Jersey Interfaith Coalition, which currently has 150 member organizations from all faiths. For Rabbi Robert Pilavin of Congregation Sons of Israel in Manalapan, the mission provided a unique perspective on Israel.